Our specialist Primary School Athletics instructors have the training to ensure students learn to use the athletics equipment safely while developing the correct techniques to fulfill this component of the NSW PDHPE syllabus and Vic AusVELS. Participating in the Moving Bodies Program, prior to your school athletics carnival is the ideal way for children to gain knowledge and confidence in each event. This allows them the opportunity to participate to the best of their ability at the school carnival. 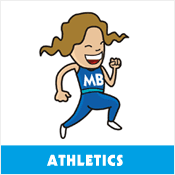 The Moving Bodies Athletics Program can also include assisting at your school Athletics Carnival.